To start with, the atmosphere was incredible with excited chatter everywhere and designers twitching with enthusiasm to explain the intricacies of their gardens and their outlook on this year’s show. Specific gardens that stood out to myself included the Welcome to Yorkshire Garden, designed by Mark Gregory of Landform Consultants for its rugged style that contrasted nicely to the other show gardens. Another design I particularly appreciated was the RHS Feel Good Garden by Matt Keightley, highlighting the impact that gardens can have on mental and physical health. 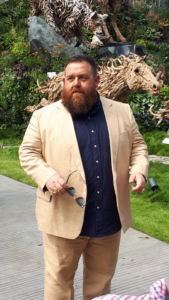 I see this as a wonderful way to raise awareness of the impact landscapes can have on people’s health, as well as building anticipation for Matt’s Wellbeing garden to be unveiled at RHS Wisley in 2020. Grievances I had with the show would be the reduced number of gardens when compared to Chelsea Flower Show’s past. In terms of specific gardens that were not to my personal taste, I was not wild on The Skin Deep Garden. While I appreciate the concept of each block representing a challenging skin condition people can face, I found the prominent greys clunky and displeasing to the eye and this made it difficult for me to appreciate the soft landscaping around them. I also felt The David Harber and Savills Garden was a somewhat less impactful ode to Ruth Willmott’s Silver-Gilt garden from last year; Breast Cancer Now Garden: Through the Microscope, so it lost points from me for unoriginality. Then again, with the incredibly high standard of gardens at this year’s show, I’m being very picky in my outlook. Some fun highlights I had of the day had to be seeing the stilt wearing people in fancy dress, watching Alan Titchmarsh hurtle out of a giant metal slide, and the beautifully warm weather that really bought out the best in the outdoor gardens. I also had a little star-struck moment when I saw Nick Frost! I’m very much looking forward to Chelsea 2019 and can’t wait to see what it has in store.